This is another of the hand-painted natural history prints from an 1822 French dictionaire that was written by Jean Baptiste Geneviève Marcellin (1778-1846). 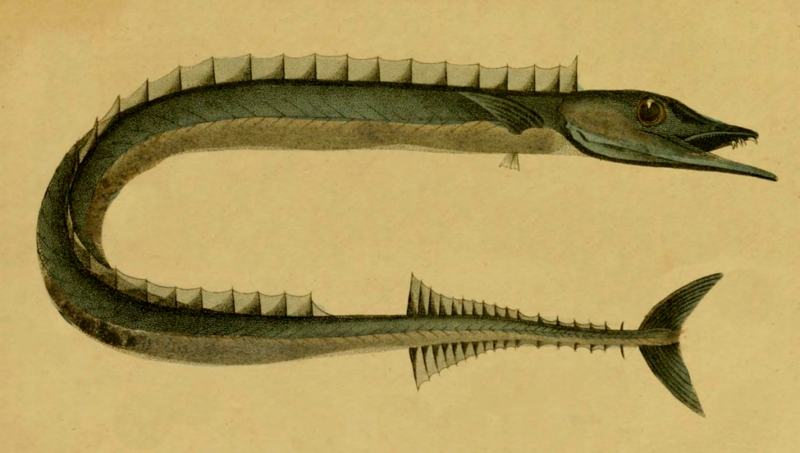 With a publication date like 1822, no matter who the artist of this long green fish drawing was, it is probably safe to say their work is in the public domain. I tried hand-copying the original text into a translator and it appears that this long green fish drawing represents some sort of gar fish that can grow up to 2 feet long. He looks a bit like some sort of sea-serpant that would be found in a fairy or fantasy tale. On the other hand, while his teeth certainly look formidable, he looks like he could be friendly. In real life, gar are far from friendly but in this creative environment of Reusable Art, we can make him exhibit whatever characteristics we like. The original drawing was displayed vertically. The constraints of the book required that, but I think he looks much better in this horizontal position. Problem with that is it makes this long green fish drawing too wide to display here. So, the drawing shown below is a slightly smaller version of the original. To see and download the full-sized version, just click on the image to access it.